Quechla, known also as the San Luis Rey River, begins in the Cleveland National Forest where several streams make up its headwaters. Following the approximate route of present-day State Highway 76, it flows west by northwest and terminates near Oceanside, California. Its drainage area is approximately 80 miles long. 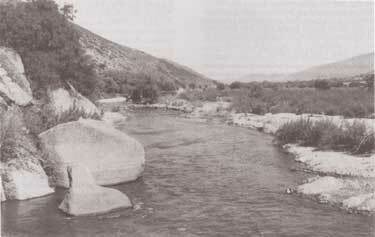 The only dam on the river was constructed in 1922 and formed Lake Henshaw just below Warner Springs. Quechla provides water to five southern Indian bands that live on or near its banks: the Rincon, the La Jolla, the Pauma, the Pala, and the San Pasqual. In the 1870s, certain lands in northern San Diego County's Quechla Basin were set aside as Indian reservations by executive order. In 1891, with the passage of the Mission Indian Relief Act, the Rincon, La Jolla, Pauma, Pala, San Pasqual, and Yuma reservations were made permanent. Meanwhile, in 1889, residents of the Escondido Valley formed the Escondido Irrigation District with the intent of obtaining water from the Quechla watershed, approximately 15 miles north of Escondido. In order to build the canal that would transport the water, the district had to obtain rights of way across both private and government land, including three of the reservations: La Jolla, Rincon, and San Pasqual. In 1894 and 1908, the Secretary of the Interior approved various documents that purported to grant the rights of way. The validity and interpretation of these documents are now in dispute. In 1905, the Escondido District failed, and the Escondido Mutual Water Company purchased all of its assets, including water rights. The Secretary of the Interior, acting on behalf of the Rincon Indians, entered into a new water rights contract with Mutual. The validity of this contract is also in dispute. In June 1922, William G. Henshaw entered into a contract with the United States on behalf of the Rincon and Pala Indians. Henshaw wanted to build a storage dam and reservoir at Warner's Ranch on the Upper Quechla, with the intent of diverting river water for irrigation. This contract is in dispute as well. In protest of the dam's construction, local Indians went to court to contest the legality of the contract. The United States Government ruled in favor of Henshaw, and a dam to hold back approximately 200,000 acre feet of water was built. In November 1922, the San Diego County Water Company succeeded Henshaw as owner of the dam, and contracted with Mutual to convey Henshaw water through the Escondido Canal. In addition to conveying water, Mutual also agreed to purchase 5,000 acre feet of Henshaw-stored water per year. In 1924, the water company contracted with Vista Irrigation Company to supply approximately 12,000 acre feet of Henshaw-stored water to the community of Vista. In 1924, the Federal Power Commission approved a 50-year license for Project No. 176 with Mutual, which included the Escondido Canal, the Rincon and Bear Valley power plants, and Lake Wohlford as project works. By 1946, Vista had purchased all of the stock of the water company and had succeeded to the ownership of Henshaw Dam and 43,000 acres of land in the Warner's Basin. In 1971, the California Division of Dam Safety declared the Henshaw facility prone to failure in the event of seismic activity. Because of the safety restrictions placed on it, forced releases of Henshaw water to the ocean caused a loss of more than $3 million in 1978 and 1979. Today, the dam functions at less than 40% capacity because it lies adjacent to the Elsinore Fault System; as a result, it cannot provide flood protection to the Indians living at Rincon, La Jolla, and Pala reservations. In 1950, 46 Indian bands, including the Rincon, La Jolla, Pauma, Pala, and San Pasqual, initiated proceedings in the Indian Claims Commission which would pay damages to the Indians from the government for failure to protect their land and water rights. In addition to damages, the Indians asked for access to Quechla's water so they could develop their lands agriculturally. Senator Alan Cranston introduced Senate Bill 1507 which provided for settlement of Indian claims against the U.S. Government and the City of Escondido. Hearings were held on July 13, 1979 before the Bureau of Indian Affairs in Washington, D.C. The bill never came out of committee, but the Indians have stated that they will continue to try to preserve the Quechla because it is an important historic resource to them.